The 25-year civil war that has ravaged Sri Lanka is heading towards its bloody conclusion and – as is usually the case in a conflict – its civilians are paying the price. As wars go, the one that has gripped this island country in South Asia has rarely been at the foreground of the World's attention. Supporters of human rights have been rightly outraged recently by regimes in Burma, Zimbabwe and Sudan, but Sri Lanka rarely gets a mention. Now, having already claimed the lives of over 70,000 and displaced more than 200,000 people, the conflict looks as though it is entering its final, violent phase. 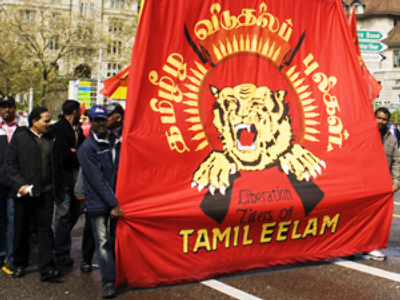 Since 1983, there has been an on-and-off civil war between the government and the Liberation Tigers of Tamil Eelam (LTTE, also known as the Tamil Tigers), a separatist militant organization who fight to create an independent state named Tamil Eelam in the North and East of the island. Now the government forces have all but surrounded the LTTE separatists in an ever decreasing circle of jungle in the island's northeast. According to Dr. Thurairajah Varatharajah, the government health officer in the warzone, artillery shelling and gun battles between government military and Tamil Tiger rebels are killing about 40 civilians and wounding more than 100 others every single day. The calls for a ceasefire are falling on deaf ears. The government forces are convinced that the Tamil Tigers, once regarded as one of the world's most ruthlessly effective guerrilla organisations, are nearing defeat. The fighting itself could be over in a matter of days or weeks. The Tigers have seen the territory under their control reduced to less than 100 square miles from more than 7,000 a year ago since the government offensive surged. Prabhakaran may well be running out of options and his dream of an independent Tamil state may be ebbing away, but he is certainly not finished yet. Only last week a suspected Tamil Tiger suicide bomber blew herself up at a processing centre for displaced residents fleeing the war zone, killing 28 people. It was the latest in a long line of vicious attacks that has placed the LTTE leader at the top end of Interpol’s wanted list for terrorism, murder, organised crime and terrorism conspiracy. Now, cornered, the fear is their attacks will become more frequent and the disregard for civilian life will become more concentrated. The Sri Lankan government, which has rejected international calls for a cease-fire, said that it had set up a seven-mile no-fire zone along the coast to help channel “humanitarian aid and medical supplies for the people stranded”. The new zone replaces a similar zone further inland, the original safety zone did little to protect the people there and with the restriction on media access to the area it’s difficult to know whether this will aid the people that need it most. 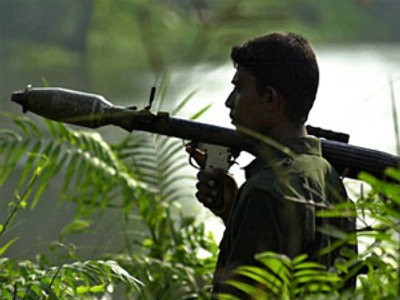 Despite being in what is expected to be in its final phase, the fighting in Sri Lanka continues to be heavy and bloody. There is little doubt that civilians are being caught in the crossfire and perhaps now, with the casualties rising daily, the rest of the world will wake up to their plight. The minimal information about incidents of causalities only highlights the dire need for international, independent monitors to be deployed as a matter of urgency. The only regrettable thing is that it took 25 years and an end in sight to the whole saga for the world to finally take notice.